Looking for a sewing machine that’s built for nothing but offering the best value to its users? Then, bless your Luck instincts for coming across the Singer 4411, a sewing machine that has been in the Sewing’s news headlines for some time now. It’s a legendary machine, designed and engineered to sew just through anything. In fact, many prefer labeling the Singer 4411 a true sewing workhorse of the new age. Wondering what’s packed in this sewing machine? We start off by informing you that this is a mechanical sewing machine. Again, the Singer 4411 isn’t for the faint-hearted. It’s an extra heavy duty sewing machine designed and built for the dynamic individuals, willing to do anything possible to reach the highest levels in the sewing profession. The Singer 4411 is a basic, high-performance sewing machine that brings you 11 stitch options. It features a gray theme with some red and white marks. Despite being mechanical, this machine comes with exceptional additional components like a one-step buttonhole and an automated needle threader. Its excellent construction got us by surprise. This sewing machine features a metal construction, stainless steel bed plate, and dials that control the needle position, stitch selection, tension as well as stitch length, and width. Features and Innovations of the SINGER 4411 Sewing Machine? 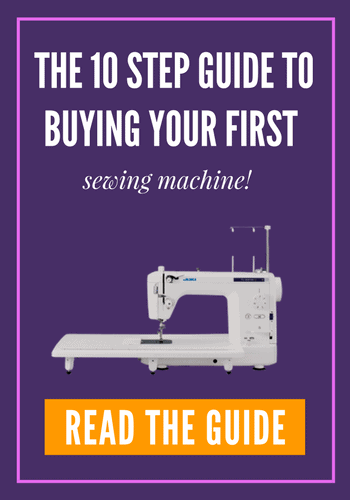 What are the Benefits of using the SINGER 4411 Sewing Machine? The speed offered by the Singer 4411 is stunningly amazing. It sews at a maximum speed of 1100 stitches /minute. You can, therefore, finish projects in no time. However, its high speed restricts its use to sewers who are well familiar with sewing machines to avoid errors. 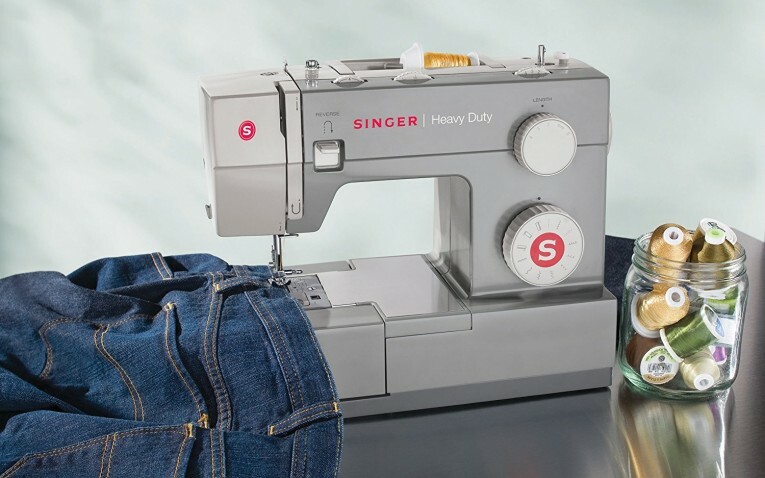 What’s interesting, the Singer 4411 is ideal for sewing any fabric all gratitude to its large metal bed plate that makes it ultra-robust and durable. You can work on thick leather, heavy materials, among other fabrics using this priceless machine. Excellent sewing speed: The Singer 4411 beats most of the competitive sewing machines that offer an operational speed of 800-850 stitches/minute, by operating at 1100 stitches per minute. Its impressive sewing speed allows for working on even the thick, stubborn fabric in no time. Ultra-durable: With its superior construction, the Singer 4411 will see you through hundreds of sewing projects for a couple of decades. All you need is to perform regular maintenance practices like lubrication, throughout its lifespan. 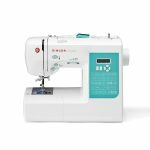 Affordable: At less than $150, hardly will you find any other sewing machine designed to offer excellent performance as the Singer 4411. The singer manufacturing concentrates on providing the best quality mechanical sewing machine at an affordable rate to all sewing enthusiasts. Ease-of-use: The Singer 4411, as we have seen above, comes with precise controls, a stable body, a large pool of accessories, as well as instruction manuals to make it incredibly easy to use. With a prior exposure to sewing machines, using the Singer 4411 should be easy as pie. What Others are Saying About the SINGER 4411 Sewing Machine ? Users of the Singer 4411 sewing machine appreciate its excellent speed and power to work with any material you throw at it. Others are grateful for its durability, reasonable price range, and ease of use. Its little operational noise seems to disturb some sewers. Fortunately, the noise is not as loud and, within no time, many get used to it. Well, after reading more than 1000 reviews of this machine on Amazon from its true users, it’s clear that it provides the best value for the money. Key Benefits to using the SINGER 4411 Sewing Machine ? 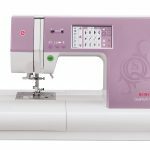 11-built-in stitches: With the featured 4 decorative stitches, 6 basic stitches, and 1 auto buttonhole you can now use the Singer 4411 sewing machine for various works including home décor development, clothing construction, crafts making, among others. 60% stronger motor: Its ultra-heavy duty motor, which is 60% more reliable than those in the standard sewing machines, boosts its superiority by a significant degree. You can, therefore, work smoothly on the heavyweight fabrics with this machine. Stainless steel bedplate: The high-grade bed plate fitted in this sewing machine allows for shake-free sewing and smooth sliding of fabric across its arm. 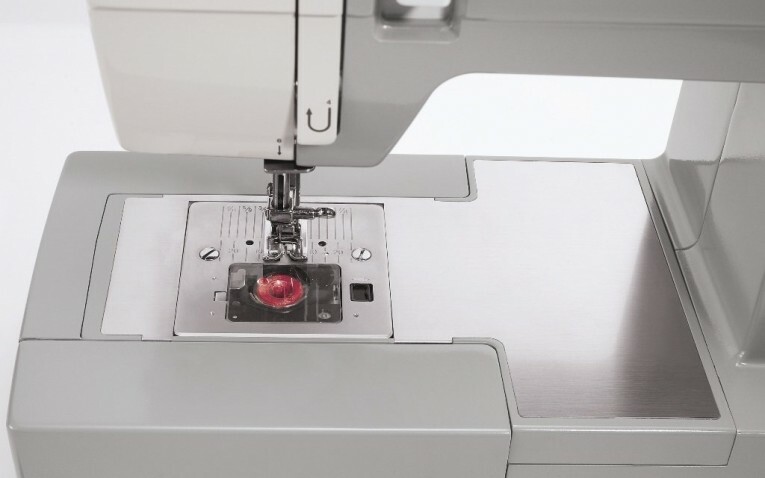 Automatic 4-step Buttonhole: Begin to make elegant, defect-free buttonholes, with the Singer 4411 sewing machines, in 4 ultra-easy steps. Sturdy metal frame: Skip-free sewing is enabled in this machine by its rigid support which holds all the components in the right alignment. Onboard storage: The featured storage compartment in the detachable sewing bed allows for storing of all accessories in the best way. What types of sewing projects can the SINGER 4411 Sewing Machine be used for? The singer 4411 sewing machine suits a large pool of sewing projects. You can use it for quilting, free-motion embroidery, and crafting. It also suits clothes and accessories construction from hats to scarves, to shoes, to bags as well as home décor products like toss pillows, curtains, drapes, slipcovers for the upholstered furniture, among others. Expect smooth, professional, high-speed sewing, as well as high-level stitch quality while working on various projects with this mechanical sewing machine. It will serve you in the best way when used for commercial purposes like tailoring or dressmaking.